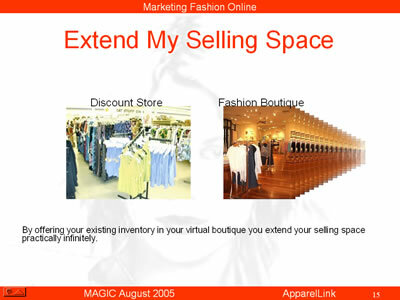 In your “brick & mortar” retail store your goal is to generate the greatest possible sales per square foot. While discounters can pile up merchandise to churn at low margins, fashion retailers (capital F) must sell on quality, not on price. You must convey a more appealing ambiance. This limits the amount of stock available for sale to your actual rack and shelf space. But since you have already invested in buying trips and other overhead associated with your marketing efforts, and since you have direct knowledge of your merchandises’ performance, there is little additional investment required in expanding your sales to the web.